Bannockburn Shire (1864-1994) was formed from the Bannockburn Road District on 30 June 1864, taking its name from the township of Bannockburn. The shire was bounded on the south by the Barwon River and on most of its east by the Sutherland Creek which flows from the Brisbane Ranges. 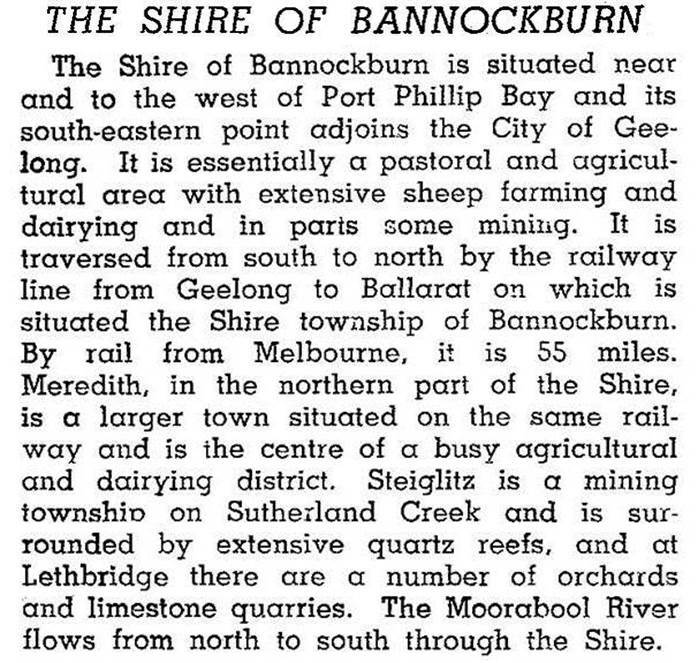 The shire’s area was 700 square kilometres, including Meredith Shire which was added in 1915. Its most easterly point adjoined urban Geelong. None of the towns had been more than a local district centre, apart from Steiglitz at the height of its goldmining activity. The industry and population were predominantly rural with supporting service activities. In 1994, 75% of the shire was farmland carrying 228,000 sheep and lambs and about 5000 cattle. A little over 4000 hectares were used for cereals. On 6 May 1994 Bannockburn Shire was united with Leigh Shire and parts of Grenville Shire and Buninyong Shire to form Southern Rural Shire, which was renamed Golden Plains Shire on 1 October 1994. The population growth during the 1980s was accounted for by rural/residential settlement near the Geelong region.